← DAVID EDWARDS. The Syrian Observatory – funded by the Foreign Office. RAMESH THAKUR. Did John Bolton try to sink the Trump-Kim summit? Had former U.S. President Barack Obama “done a Trump” with North Korea — agreed to a summit with Kim Jong Un without requiring denuclearization first, secretly sent his secretary of state to Pyongyang, described Kim as “honorable.” canceled joint military exercises with South Korea, been prepared to consider pulling U.S. troops out of Korea — the right-wing establishment and populace would have branded him a traitor. President Donald Trump earned multiple nominations for the Nobel Peace Prize for the same — until his National Security Adviser John Bolton nearly cost him any chance of that treasured award. Trump’s base follows him like the pied piper of modern times. His cancellation of the Singapore summit, widely judged to be a case of self-harm, was described as “a fine example of ineptitude,” a “debacle,” “a train wreck foretold,” that “handed the world’s most brutal dictator a win.” Then the unpredictable Trump reinstated it. Thus last year’s nuclear brinksmanship with North Korea has been followed by summit brinksmanship as the world breathlessly awaits the next twist in the on-again-off-again summit. To unabashed admirers, the shrewd president has “out-Kimmed Kim,” proven he is tough enough to follow his own advice on knowing when to walk away as a negotiating strategy and refused to fall into the trap of appeasement. In this parallel universe, Trump was bold and decisive in accepting the invitation to give denuclearization a chance, and equally bold and decisive in rejecting anything short of the goal. To some, this is already a Bolton administration. 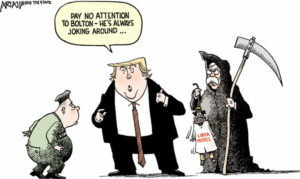 Bolton is no diplomat, detests professional diplomats as gutless appeasers, has yet to meet an arms control agreement he likes or a crisis that cannot be solved by bombing the enemy, and has openly advocated regime change in Tehran and Pyongyang. He may share Japan’s apprehension that Trump could lift all pressure on Pyongyang in return for Kim’s promise of no further development of an ICBM nuclear capability. This would keep the U.S. mainland beyond the range of Kim’s bombs but leave Japan and South Korea at Kim’s nuclear mercy. Barbara Tuchman said of King Philip II of Spain: “No experience of the failure of his policy could shake his belief in its essential excellence.” Bolton, too, is unshakable in his conviction that the invasion of Iraq was America at its finest and most successful. Before joining the White House, he wrote that pre-emptive attacks on North Korea would be legally justified and explained in an interview that the upcoming Trump-Kim summit would prove the futility of negotiations with North Korea, paving the way for military action. North Korea’s leaders have been strongly motivated to get the bomb because of the cruel fate, no mater how deserved, that befell no-bomb Slobodan Milosevic of Serbia, Saddam Hussein of Iraq and Moammar Gadhafi of Libya. The last is an especially important lesson for them because Gadhafi voluntarily gave up his quest for the bomb in return for a promised normalization of relations with the United States and integration into the international community. Pyongyang has always insisted on phased denuclearization of the Korean Peninsula with a choreographed sequence of matching concessions to the North: a formula on which it has often reneged in the past. With Trump having first denounced and then unilaterally renounced the multilateral deal with Iran that had mothballed the latter’s nuclear program, Pyongyang was already nervous about U.S. good faith and the worth of its word. Into this combustible scenario Bolton threw a diplomatic hand grenade with the incendiary suggestion that Pyongyang could follow the “Libya model” of complete denuclearization before receiving economic assistance and other benefits. Bolton, a battle-scarred veteran of bureaucratic in-fighting, is a seasoned operator who must have known the import of referencing Libya. Was he set on sabotaging the summit with a cunning and calculated thrust at North Korea’s most sensitive diplomatic nerve? Trump hurriedly distanced himself from Bolton’s remarks but seemed not to know what the Libya model means. Vice President Mike Pence warned that if Kim did not make a deal, North Korea would indeed meet with Libya’s fate. On May 24, an incensed Choe Son Hui, Kim’s vice minister of foreign affairs, threatened a “nuclear-to-nuclear showdown.” Trump responded to the repeated bellicose rhetoric by canceling the summit, only to reinsert it on his calendar after a surprise second meeting between Kim and President Moon Jae-in with conciliatory remarks. Both sides believe they are coming to the summit from positions of strength and the other has made major concessions. The Americans concluded that toughening sanctions had brought North Korea to its knees and made it desperate to conclude a deal on U.S. terms. But Pyongyang thinks its growing nuclear strength has forced Washington to agree to a summit without preconditions and accord Kim the coveted legitimacy of Trump’s equal as head of state. The contradictory beliefs, motivations and scope of denuclearization — North Korea or the whole peninsula — and the wildly erratic and blustery leadership styles of Trump and Kim will keep us on the edge of our seats as June 12 approaches. This article was published in The Japan Times on the 31st of May 2018. Ramesh Thakur, a former U.N. assistant secretary-general, is a professor emeritus at the Crawford School of Public Policy, Australian National University.